The Red Cube is an iconic public sculpture piece located in Lower Manhattan at Broadway and Liberty Street. Although the sculpture is titled “Red Cube” and appears to be a cube, it’s actually not a quite a cube. The shape is stretched out along one axis, adding to the somewhat precarious feeling of the piece’s balance on one point. The bright red color stands out in stark contrast to the blacks and grays of the surrounding skyscrapers. It makes a nice photo op. The Red Cube is the work of Japanese-American artist Isamu Noguchi. Additional Naguchi pieces can be found at the Noguchi Museum on Long Island. 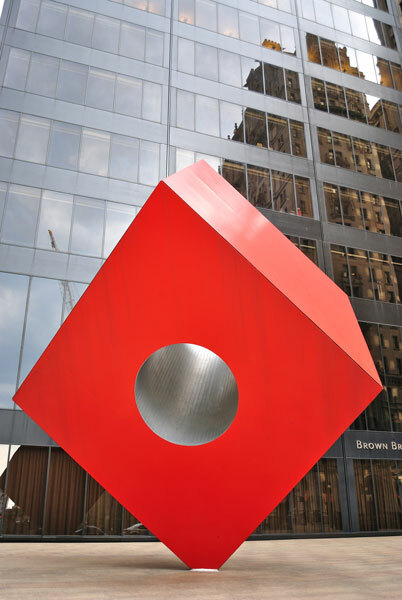 The Red Cube sculpture is in the Financial District of Lower Manhattan. It’s on Broadway, between Liberty and Cedar Streets, and across from Zuccotti Park. Nearby sights include The World Trade Center, 9/11 Memorial, Trinity Church, and the Federal Reserve Bank.